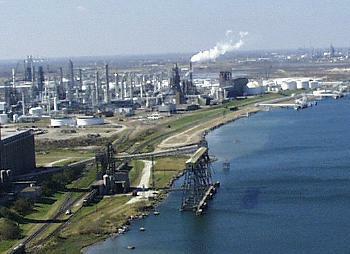 There are a group of refining and petrochemical facilities operating in Corpus Christi, Texas, that emit substantial quantities of benzene into the atmosphere. We undertook a process analysis to identify specific industrial sources of benzene at three major oil refineries and several associated petrochemical plants. Given the results of our analysis, air dispersion modeling was used to calculate ambient air benzene concentrations in several nearby neighborhoods. We reconstructed metropolitan ambient air benzene concentrations for the years 1975, 1989, 1990, and 1992. Click here to view a benzene isopleth map. Click here to view a video of Corpus Christi benzene animation. The depicted isopleth lines represent hour by hour changes.